I can’t remember the last time I bought iceberg lettuce. Like an actual head of iceberg. I feel like it’s the Adam and Eve of lettuce. 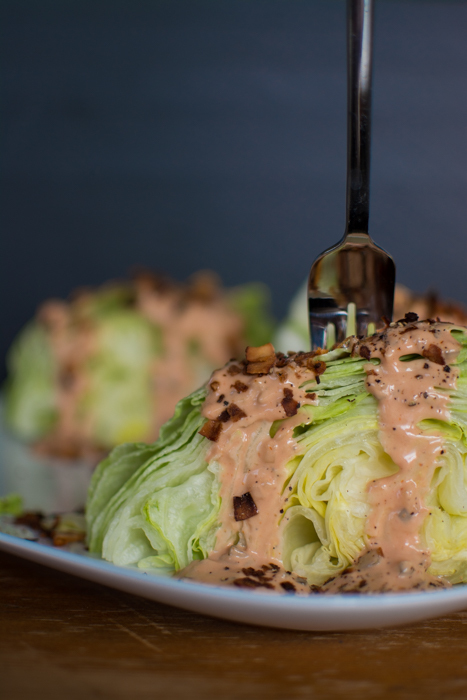 Iceberg was at every salad bar I ever grew up eating from. Before kale or romaine were staples. At some point in time probably from a women’s health magazine I learned that iceberg was a negative on the nutrient scale. Like there was absolutely no point in buying it. Or maybe it was clever marketing from brands releasing spring green mixes?? All we were to know is it was basically green-tinted crunchy water. 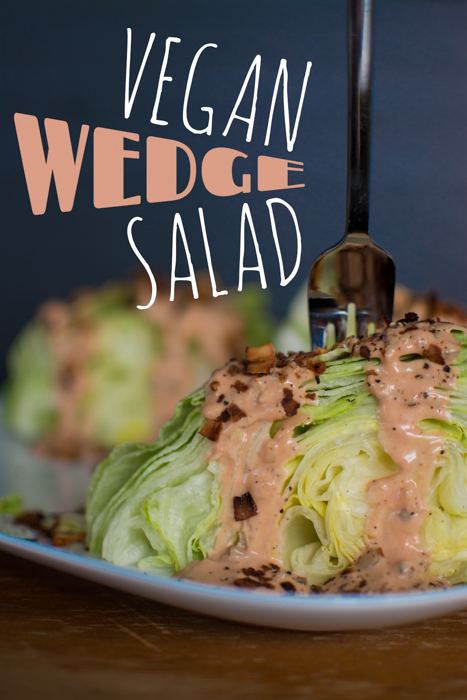 But I’ve learned a little bit from making this super beautiful vegan wedge salad. A head of iceberg is super cheap. A mere $1.49 a head. 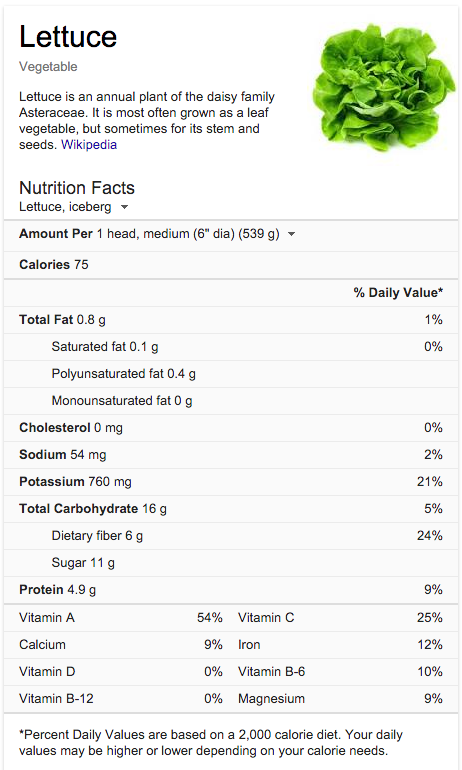 One medium head—which could be the base for an individual serving of salad—contains only 75 calories, < 1 g of fat, 2% sodium, 21% potassium, 24% fiber, 9% protein, 54% vitamin A, 25% vitamin C, 9% calcium, 12% iron, 10% vitamin B6, and 9% magnesium. Not too shabby. An easy budget-friendly green to get between purchases of more nutritionally dense greens and lettuces. This salad left me feeling that I had dined at a ‘once popular in it’s day’ sort of restaurant in downtown Chicago. 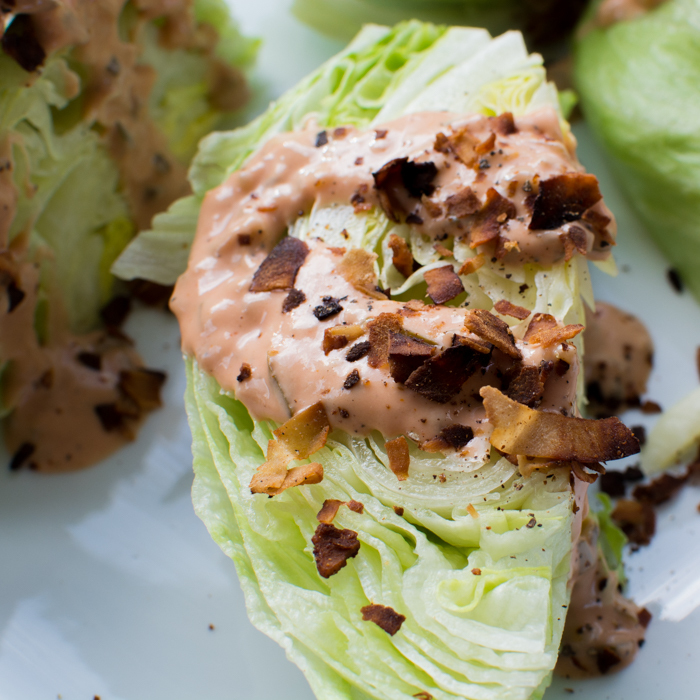 Drizzled with a favorite creamy dressing [Vegan Thousand Island or Gratitude Salad Dressing] and sprinkled with yesterday’s veg-friendly coconut bacon the mix of flavors and textures are welcoming. 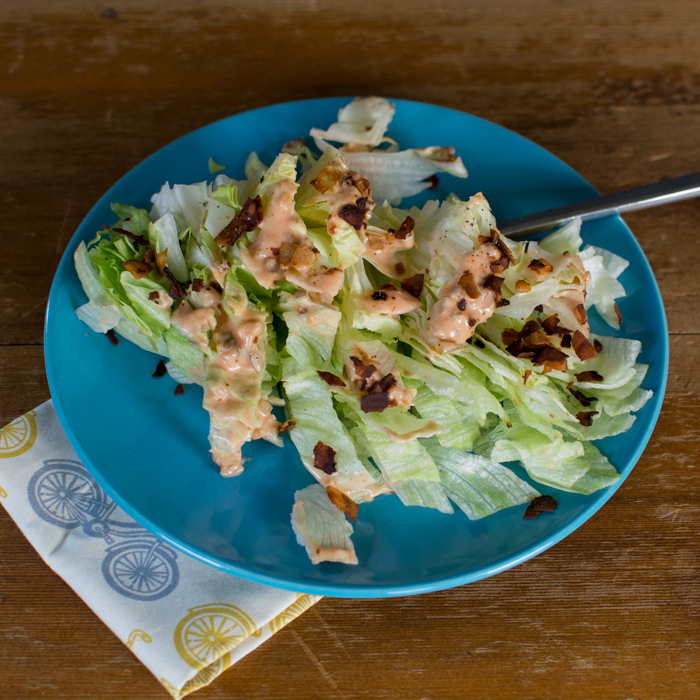 There’s the wet hydrating crunch of lettuce drizzled with the sweet and salty tang of dressing and casually finished off by the crispy crunchy salty coconut bacon. Remove iceberg's outer leaves and the stem. Cut into quarters with a sharp knife. 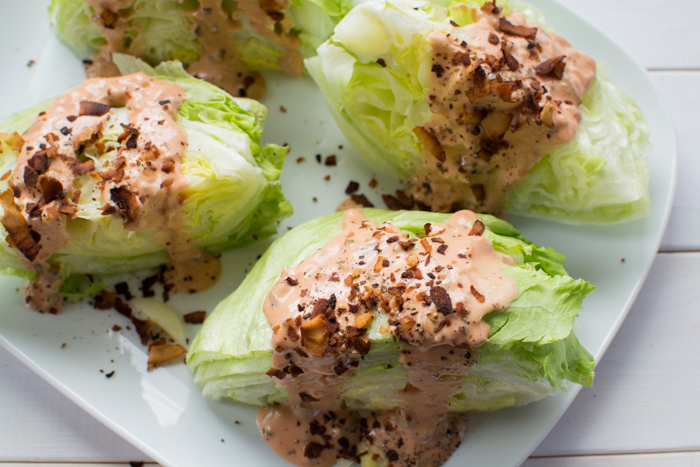 Arrange quarters on a plate and drizzle the dressing over each quarter evenly, approximately 2 tablespoons each. Sprinkle coconut bacon evenly over the tops crumbling between your fingers slightly. 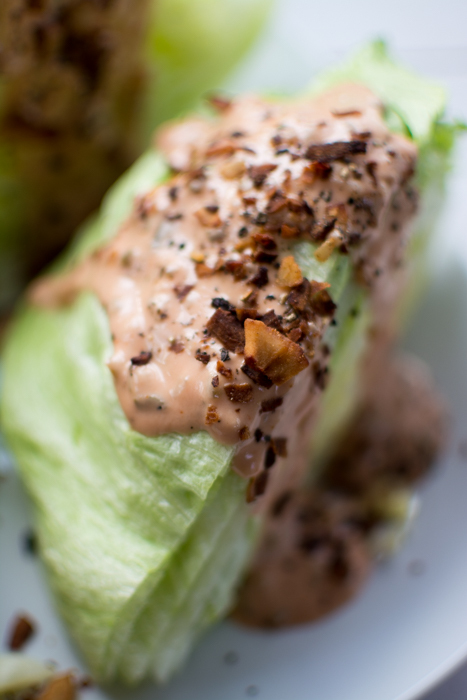 Finish off with a smattering of fresh black pepper. The pepper and coconut bacon really make the aesthetic value pop. 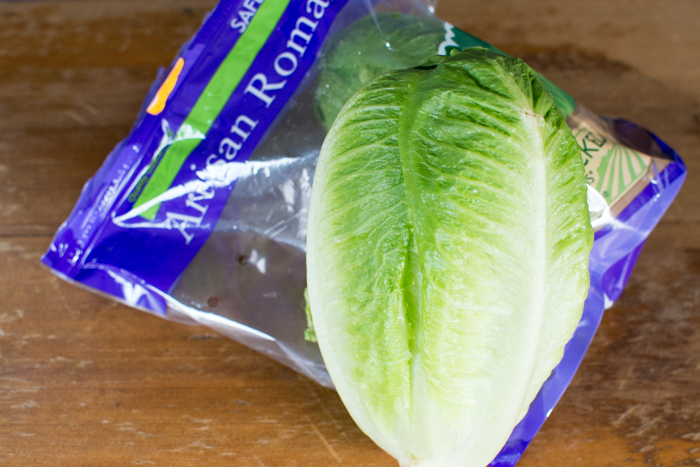 A small head of Artisan Romaine also looks lovely. 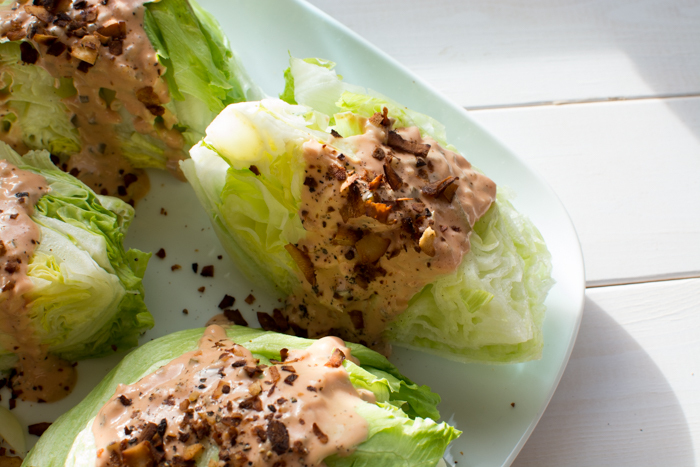 Transfer the wedges to plates and serve with serrated knives and forks.